Ladies Bible Study (Wed.) 9:15 a.m. Wed p.m. Adult Prayer Fellowship 7:00 p.m.
Fri. Teen Youth Night 7:00 p.m.
* Rev. M. M. Lewis, September 23, 1912 - ? "J. Windfield Bronson came to North Chester Baptist in 1943. His first wedding that he performed was on 9 Oct. 1943. It was mine. I don't know how long he stayed there." Over forty years ago the old Oak Grove School House, in the then rural district of Chester, was doing double duty. During the week days the conscientious school master reigned supreme and added his mite in the training of future citizens along general educational lines and on Sunday, good sound bible instruction was faithfully imparted to old and young alike who made up a strong a growing Sunday School. Fortunate indeed was the school in having among its leaders a philanthropic man, whose name and memory is well known throughout Chester and is indelibly written in the history of the present church - Mr. James Irving. When the school outgrew its quarters and its membership passed the one hundred mark, Mr. Irving built a neat Chapel at what is now 23rd and Providence Ave., Chester, which was dedicated to religious work with impressive ceremonies on June 2, 1872. Good seed continued to be planted and was rapidly maturing to good fruit, when a year later it was found necessary to organize a church of the Baptist faith and order. On April 26th, 1873, eleven persons, members of regular Baptist Churches, met at the home of Mr. James Irving and effected the organization of the church. To these eleven persons four more were added as constituent members at a later meeting before the granting of the charter, of which number only one is still with us, Miss Saphronia Miller. It was first voted to name the organization "The Oak Grove Baptist Church" with James Irving as its first Deacon and Rev. E. Wells as its first Pastor. On May 9th, 1873 a council of eighteen delegates from the Upland, First of Chester, South Chester, Marcus Hook, Ridley and Mantua Baptist Churches found conditions satisfactory and the church was duly recognized. It may be of interest to note that of those taking part in the recognition services, one man is still living, the Rev. Dr. J. G. Walker, who represented the Mantua Baptist Church forty years ago and is still pastor of that Church. The first baptism was held March 25th, 1873, administered in the race at Mr. Irving's mill, of these eight candidates only one is still a member with us, Mrs. John T. McCain. At the second baptism, Mrs. Harriet Dutton was one of the candidates and is still with us. On June 27th, 1873, the name North Chester was substituted for Oak Grove, thus giving the church its present name. The church was granted admission to the Philadelphia Association on October 3rd, 1873k, at which time the Sunday School averaged in attendance one hundred and thirty-two persons from whose adult department the new converts were received. At the last baptism of the first year of the new church five persons were immersed in the race, three of whom are still with us - Mr. William Irving, Mrs. George West and Mrs. George Lindsay. Thirty five members were received during the first year, twenty one of whom were baptized. On June 9th, 1876 the first Pastor Rev. E. Wells presented his resignation to take effect August 13th following. Thus ended the first pastorate of the church after three years, three and one half months. It was a period of commendable progress, there having been fifty-nine members added, forty by baptism, fifteen by letter and four by experience. Thus it is seen the church had an auspicious beginning. Due credit must here be given Mr. James Irving for his part in the success of the church during its first year and the years which have followed. He presented them with a house of worship free from incumbrances. He helped to solve the problem of the financial support of the new organization by paying half the Pastor's salary and furnishing him with a parsonage free. Aside from this he not only gave large gifts from time to time but helped the church fulfill its mission by throwing himself heartily into its life and work. The second pastor, Rev. P. S. Vreeland entered upon his work September 13th, 1876 and during his ministry of over two years there was a period of training rather than one of evangelism. The subject of discipline occupied a prominent place in the business meetings of the church throughout. Rev. Vreeland left the church to engage in work for the American Baptist Publication Society and was followed by Mr. Brooks of the Seminary, who was ordained to the gospel ministry as soon as he took charge. During his pastorate twenty-four were received, fifteen of whom came by baptism. The new baptistry came into use for the first time during his pastorate and Mrs. James moss, who is still with us, was numbered among the three who were first immersed in this pool. Pastor Brooks left the church some time in 1882 after serving what has since proved to be the longest pastorate, being with us for over five years. The next pastor was Rev. C. T. Hallowell, whose stay while of short duration was nevertheless marked by aggressive work and affectionate and helpful co-operation on the part of the people. Thirty-eight were received into fellowship. It was also a period of discipline and in all seventeen were excluded from fellowship because of conduct unbecoming Christians and failure to live up to their Church Covenant. Pastor Hallowell was forced to leave because of ill health and the resolutions drawn up by the Church commending his services among them showed the best of feeling existed between pastor and people. The followed a period of short pastorates under M. M. Finch, Ira D. Mallery and Joshua E. Willis. On the whole few accessions were made by baptism but considerable losses were sustained by letter. On September 26th, 1888, Mr. George Lindsay was elected Church Clerk and has held that responsible office of the Church ever since. Rev. D. T. Firor entered the pastorate August 24th, 1893, and remained almost four years. This pastorate was marked by two events of no little moment in the history of our church. The first was that of the establishment by Rev. Firor of a mission at 15th and Potter Streets, March 10th, 1895, which has since grown into the Emmanuel Baptist Church. The other event was that of the death of Deacon James Irving. Not only had he founded the church and placed it upon a good foundation, but down through the twenty-two remaining years of his life he gave to it his continuous and hearty support, both by way of gifts and service. For eight years he served in the capacity of church clerk, rarely missing a monthly business meeting, and to the end of his life served as deacon of the church. Rev. Firor was succeeded by Rev. George Widdowson and after a short pastorate of little more than a year was followed by Rev. Williams. This too was a short pastorate of little over a year but marked the accession of sixteen persons into fellowship. During his pastorate Mr. Wood, son of Deacon Wood, Sr., deceased and Mrs. John Wood, Sr., who is still with us, was ordained to the gospel ministry. Rev. Wiltbank became the next pastor and was ordained to the gospel ministry three months later and served the church nearly two years. Rev. Henry Alfke, Jr., entered upon a pastorate which, in some ways, was the most aggressive and successful of the more recent pastorates. One of the special achievements of the church in a material way was the building of an addition to the church for Sunday School, prayer meeting and other purposes. The present church organ was also purchased and installed in the auditorium. Twenty-three persons were received into church fellowship and Mr. Ebert Huff was ordained to the ministry. After three years and four months of service Rev. 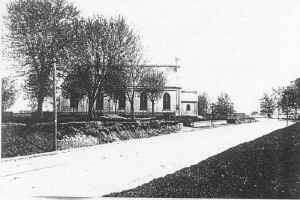 Alfke left for the Parker Ford Church and was followed on June 20th, 1906 by Rev. E. T. Humpton whose pastorate was the second longest of all fourteen, extending over four years and two months. The progress of the church under him became steady and sure and his method of putting the various departments of the church on a sound working basis was productive of much good and the fruit from his seed planting is being reaped today. Nine additions were made to the membership, the finances of the church were bettered and on the whole a good spirit prevailed. Rev. P. R. Hayward took charge of the church January 8th, 1911, while still pursuing studies at the Seminary and University. During his brief pastorate of eighteen months six accessions were made by baptism. The cause of Missions, both Home and Foreign was admirably championed by Pastor Hayward and the church has done better along those lines during his stay than in its history. A monthly paper carrying the current news of the church to members and friends was started by him and still exists, doing considerable good. The building was renovated and put in very acceptable shape as to comfort and looks. Pastor Hayward resigned May 8th, 1912 to take effect June 30th following and the present pastor took charge September 29th, 1912. Mr. Lewis was ordained to the gospel ministry on December 10th, 1912 and in the seven months since progress has been made along all lines. The congregations have increased at both services, finances improved, church spiritually aroused through extra services, fourteen persons baptized, two received on experience and one by letter; three lost by letter and a number of names dropped. Thus we have touched upon the main facts of forty years history. A period, on the whole, filled with its ups and downs, its gains and losses, struggles and attainments, bright spots and dark spots, but, with all, standing firm to the original purpose of spreading the gospel of Christ throughout this community and acting as a beacon light to many a sea worn and billow tossed mariner. This church has, in her history, called and ordained three of her pastors, sent out three men into the ministry and licensed two to preach but later recalled one. Fourteen Pastors have stood in her pulpit serving everywhere from a year to over five years. 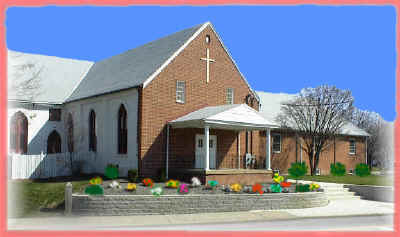 She is the mother church of what is now Emmanuel Baptist Church at 15th and Potter Sts. and has indeed existed to serve in various ways more than to be ministered unto. Still she stands and still she shows signs of growth and we trust that forty more years will reveal much more seed sowing and harvest for the Master. � 2000, 2001, 2002, 2004 John A. Bullock III.